I consider European vegetables like endives and artichokes to be exotic. When I was growing up, I did not even know these vegetables existed, let alone find them. My initial thought when I saw endives were that they are baby Napa cabbage. While Napa cabbage is seldom eaten raw except when pickled, endives are often served raw. The shape of endive leaves lend themselves very well as little “boats” for a variety of stuffing. The leaves are refreshingly crisp and crunchy with a slight bitter after taste that is not at all unpleasant. Their diminutive size makes them ideal for appetizers since they can be easily held and eaten. For the stuffing, I have decided to combine the slightly salty lox (cured salmon) with 1/3 fat cream cheese. The finely chopped toasted pistachios provide additional texture and the curly parsley gives a contrast of colors. 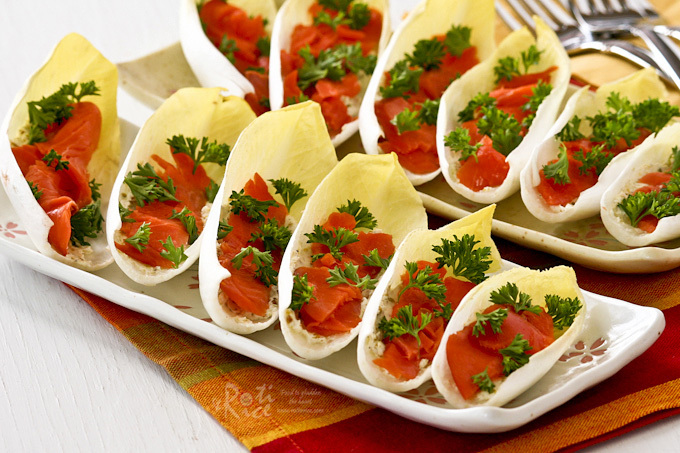 These Stuffed Endives with Salmon and Pistachio Cream Cheese are an easy, attractive, and tasty appetizer to put together when there is company. Cut lox into strips. Drizzle with lemon juice. Combine cream cheese, pistachio, and pepper in a small shallow bowl. Mix well with a fork. 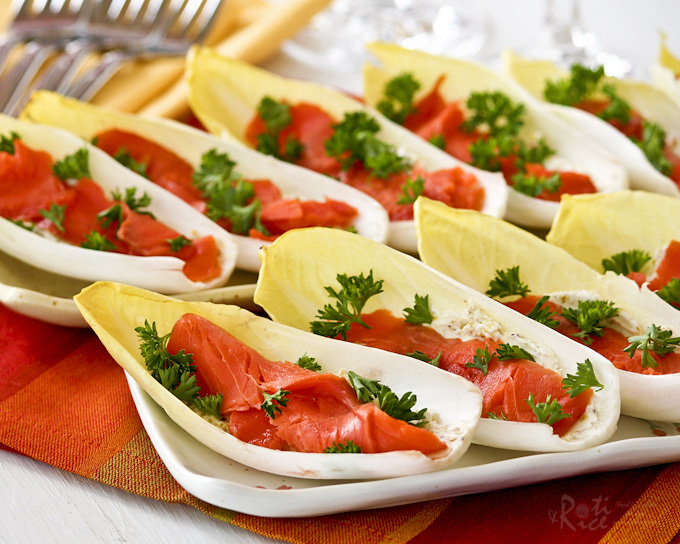 Spread one teaspoon of cream cheese mixture onto each endive leave. Place 1 or 2 strips of lox on the top. Sprinkle parsley on the top. Serve immediately or cover with plastic wrap and chill until ready to be served. Very creative Biren…love the combination of lox and cream cheese…nice and healthy. 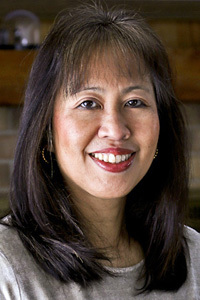 Thanks Juliana and it is good to see you here. 🙂 I do like the combination of lox and cream cheese. They seem to go so well together. 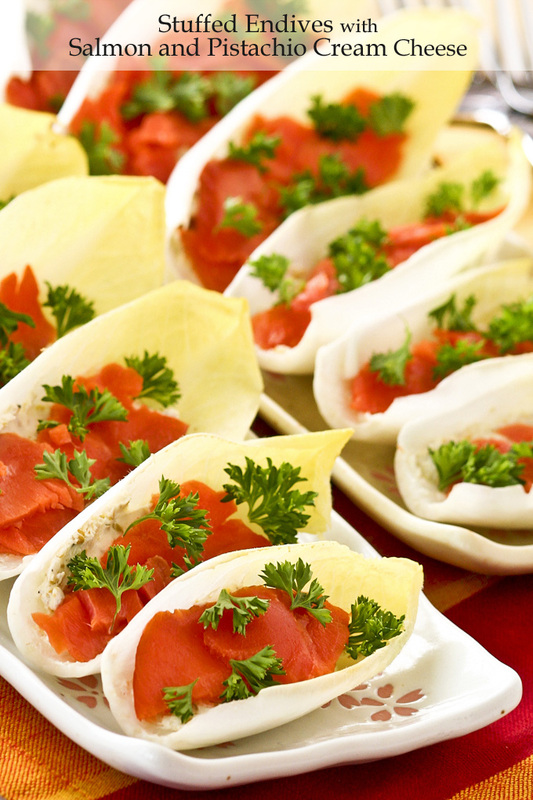 Endive and smoked salmon are such a wonderful combination, and the pistachio cream cheese is a brilliant idea!